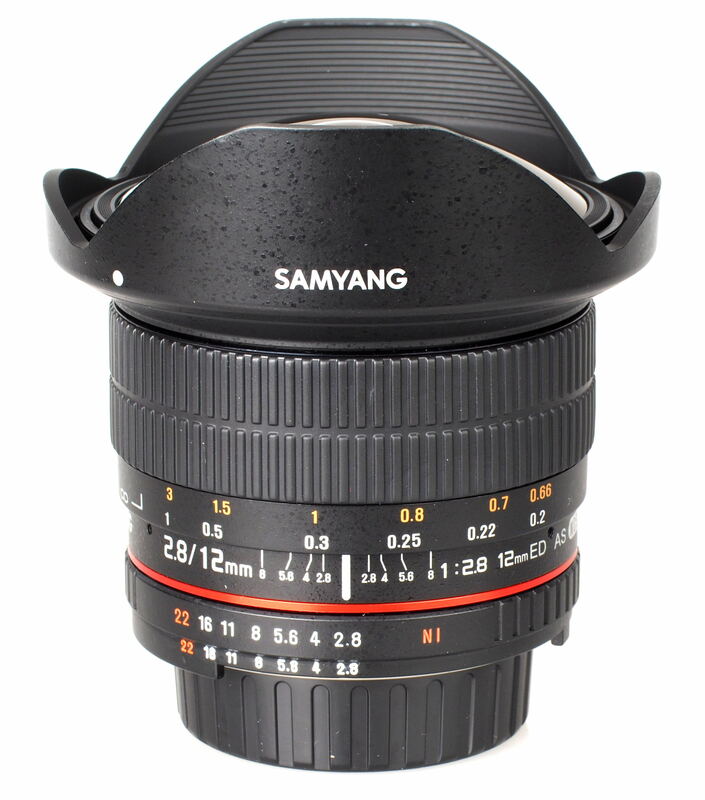 Find out how this 180 degree full-frame fish-eye lens from Samyang performs in our review. This 12mm fisheye lens provides a diagonal field of view of 180 degrees on a full-frame DSLR, sports a f/2.8 maximum aperture and the AE version we are reviewing here is available for around £390 for Nikon cameras. The AE version has a metering chip built in to transfer exposure information between the lens and the camera. 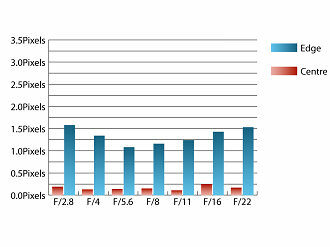 A non-AE version of the same lens is available in Canon, Four Thirds, Pentax and Sony flavours. In this review we’ll take a look at how it performs. The build quality of this 12mm fisheye lens from Samyang is excellent indeed. 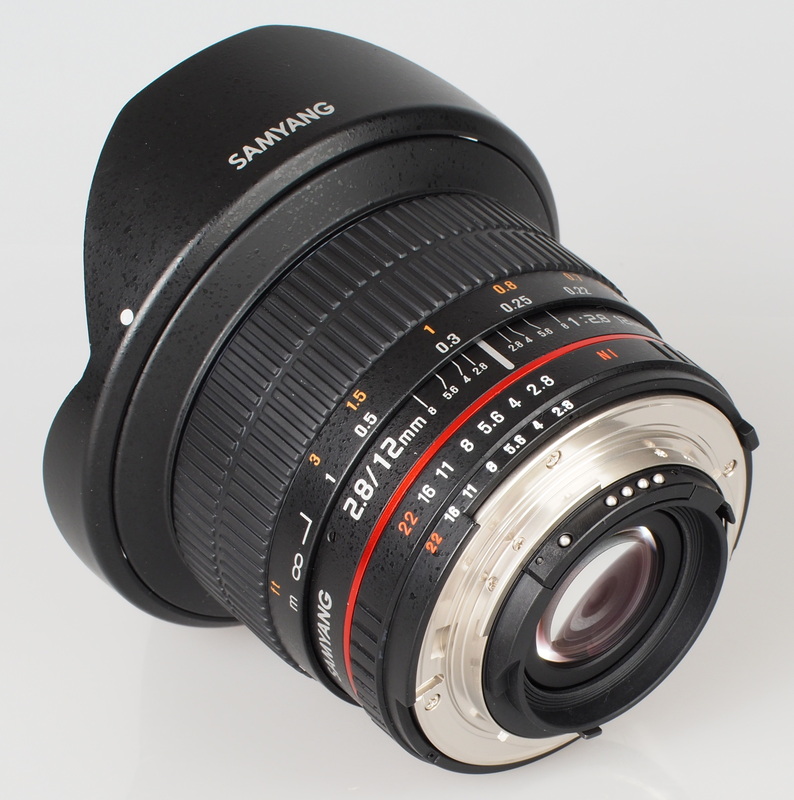 High quality plastics have been used for much of the lens barrel and the lens mount is metal. It feels robust, yet isn't too heavy at around 500g, and as a result, it balances well on the Nikon D600 used for testing. Focusing is manual, and the action of the focus ring is smooth and precise. Focus distances are marked on focusing ring, and there is a useful hyperfocal scale. There is no hard stop for infinity due to the use of ED glass in the optical design, which is a shame. As is standard with fisheye lenses, taking images of anything over two to three metres away is simple, as the lens can simply be left set on or close to infinity due to the huge depth of field you get with this lens. For closer distances it is recommended to use the electronic focus confirmation feature of your DSLR, or a dedicated focusing screen for manual focus lenses if taking still images using the viewfinder. If recording video, viewing a magnified section of the frame will ensure accurate focusing. At maximum aperture, sharpness is very good in the centre of the frame, and only slightly behind towards the edges of the frame. 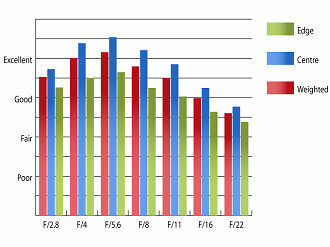 Stopping down improves sharpness in the centre of the frame dramatically, reaching outstanding levels by f/4. 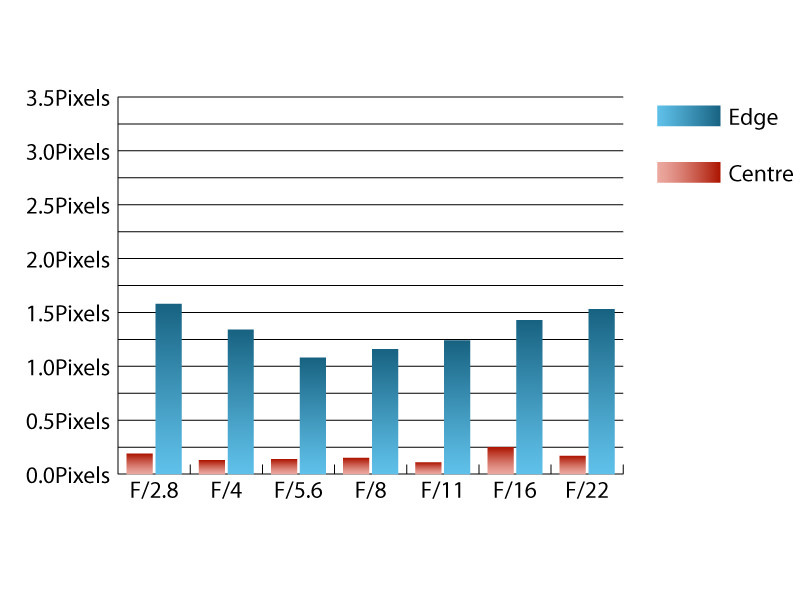 However, levels of clarity towards the edges of the frame are never quite as high, reaching very good levels between f/4 and f/5.6. Even so, this is still very good performance across the frame for a fisheye lens. Levels of chromatic aberrations are typically high for a fisheye optic, just exceeding 1.5 pixel widths towards the edges of the frame at maximum aperture and f/22. Straight lines placed towards the edges of the frame curve wildly, as is typical of fisheye lenses due to the extreme field of view. However, this lens produces images with stereographic projection, which means that images are more natural looking than typically found with fisheye lenses that produce images with equal-area projection. Objects placed near the edges of the frame appear less squashed than those taken with a lens that produces equal-area or orthographic projection. Flare and loss of contrast when shooting with bright light sources in the frame are both controlled well, with good contrast being retained when shooting into the light. A little flare and loss of contrast may be seen with a bright source of light in the frame when shooting at wide apertures, but this is reduced as the lens is stopped down. The hood on this lens is removable, although I see few situations where you'd actually want to do this. In fact the removable hood could do with being attached more securely, as it has a habit of detaching itself when changing lenses if extra care isn't taken. 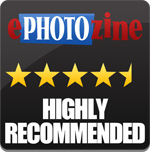 Being priced at around £390, for the AE version, this lens represents excellent value for money, especially given its optical performance and stereographic projection, which makes it unique amongst full-frame fisheye lenses. 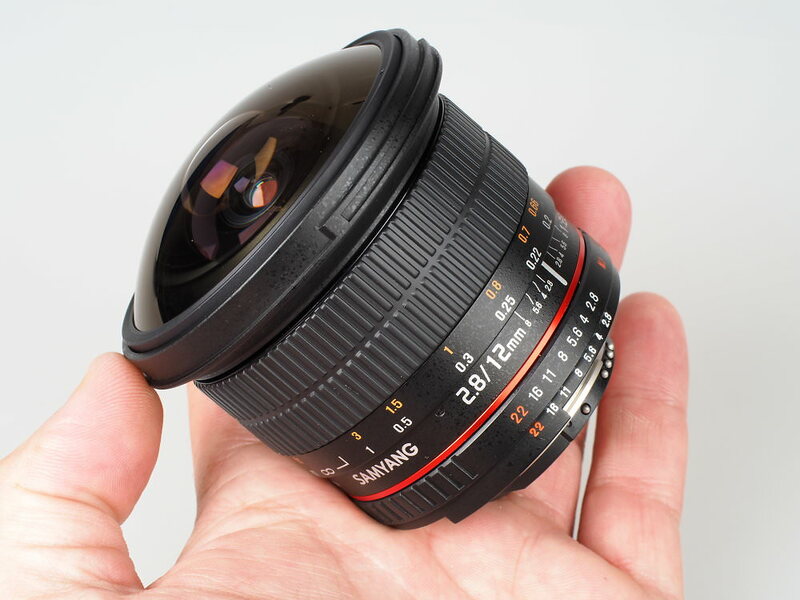 Canon only currently offer an 8-15mm f/4L fisheye zoom, which provides a circular and diagonal fisheye in one lens on a full frame camera. This lens isn't cheap either, retailing for around £900. Nikon's 16mm f/2.8D fisheye uses an equal-area projection, which gives a more pronounced fisheye distortion effect, with objects towards the edges fo the frmae appearing more compressed to fit within the frame. This lens also provides autofocus, but costs £620. Finally, Sigma also offer a diagonal fisheye lens. 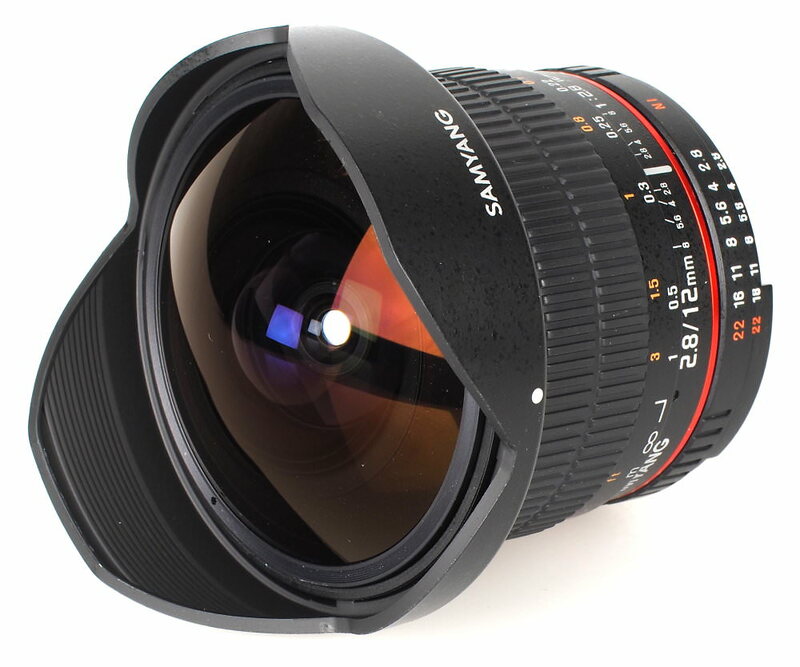 Their 15mm f/2.8 fisheye has a fast f/2.8 maximum aperture and silent autofocus, but costs around £470. At face value, this 12mm fisheye lens from Samyang would be good value if it was only half-decent, due to the low price and excellent build quality. The fact it is capable of producing images with outstanding sharpness and offers a unique stereographic projection, means that this lens should be high on the wishlist of anyone looking for a diagonal fisheye for their full-frame DSLR. The Samyang 12mm f/2.8 ED AS NCS Fish-eye is capable of producing images with outstanding sharpness. This must go on my wish list !!!!!! !......very impressive image quality, particularly of the 'Conservatory' & the canal scenes !! I use the 8mm Samyang on my Canon APS camera with great results....so this 12mm version on my 5D should be ideal !!! Wish, wish, wish !! !....& fingers crossed ! Ich habe mir auch das Objektiv gekauft und bin begeistert. Ich habe es fast immer im Rucksack dabei.